Here is a fun fact about our pretty girl Pinky: she was actually featured as Pet of the Week for South Bay and Harbor Area shelters! How she found herself in the shelter system in San Pedro beats us, but she has come a long way since her rescue. She spent a few months in foster with our director, where she lived in harmony with resident dogs and learned her house manners. Today, Pinky is housetrained, knows her basic commands, knows fetch, is good with dogs, and loves to gives kisses to her favorite human companions. She does need a firm and experienced owner who can show her right from the beginning that Pinky is not in charge, but once you set those initial boundaries with her, she is just like any other happy-go-lucky pooch. Pinky likes to spend her time roaming the play yards, wrestling with her canine buddies, or chasing after toys you throw for her. She also enjoys going on walks or skateboard-walks with some of our volunteers! 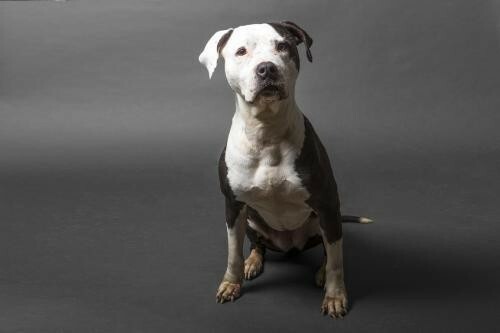 Pinky is a playful, active, loving, and great dog who would make a wonderful hiking or running buddy. She just turned 8 years old in May 2018. She tipped the scales at an even 50 pounds at her last weigh-in. If you think Pinky sounds like the right girl for you and you are up to the task of giving this long-timer a well-deserved forever home, Pinky will joyfully reciprocate with a lifetime of cuddles and kisses! If you'd like to meet Pinky, please visit www.thebarkinglot.net/adopt.